The Lembeh Strait in North Sulawesi, Indonesia is renowned as being the planet’s epicenter of marine bio diversity. Here you’ll find a higher concentration of marine life than anywhere else on the planet. World famous for macro photography and its wondrous critters (sometimes referred to as muck diving), Lembeh also offers many other underwater riches including beautiful soft coral sites and several historic wrecks. Offering something for everyone, Lembeh is a truly unique holiday destination. 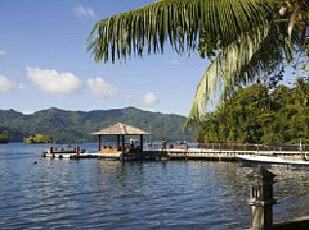 Kungkungan Bay Resort (or just KBR to its many fans) is located in the very heart of the Lembeh Strait, giving access to forty dive sites, all within fifteen minutes of the private jetty. An intimate and exclusive resort, Kungkungan is staffed by a friendly, professional team who will look after your every need from the moment you arrive to the moment you depart. All rooms are sea facing, with three categories of spacious accommodation to choose from.